LOCATION.--Lat 42°59'06.8", long 74°59'25.6" referenced to North American Datum of 1983, Herkimer County, NY, Hydrologic Unit 02020004, on right bank at downstream side of bridge on State Highway 168, 2.2 mi southeast of Main Street in Mohawk, and 2.7 mi upstream from mouth. GAGE.--Water-stage recorder and crest-stage gage. 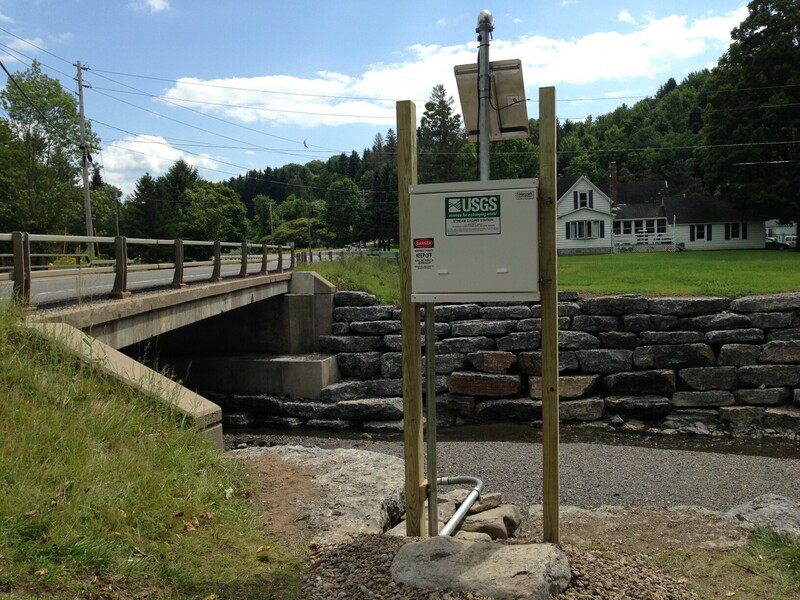 Datum of gage is 533.14 ft above NAVD of 1988. Prior to Apr. 18, 2017 at datum 1.00 ft higher. REMARKS.--Water Years 2015-16, 2018: Records fair except those for estimated daily discharges, which are poor. Water Year 2017: Records poor. EXTREMES FOR PERIOD OF RECORD.--Maximum discharge, 1,450 ft³/s, June 6, 2017, gage height 5.23 ft; minimum discharge, 0.56 cfs, Sept. 7, 2016; minimum gage height, 1.32 ft, Sept. 29, 2017. EXTREMES OUTSIDE PERIOD OF RECORD.--Outstanding floods occurred in August and September 2011. Flood in August or September 2011 reached a stage of about 14.6 ft, present datum, discharge not determined, from information by local resident. Flood of Aug. 15, 1986, reached a discharge of 1,540 ft³/s, by computation of flow-through-culvert measurement at site 0.4 mi upstream (drainage area, 21.4 mi²).